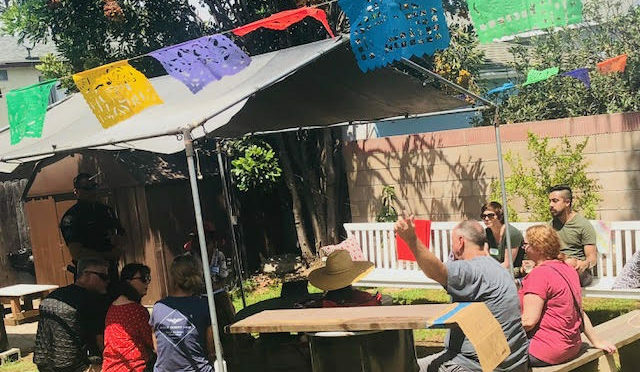 Residents on E 5th Street from Junipero to Molino Avenue, as well as surrounding neighborhoods gathered on Saturday, July 7th to discuss safety concerns and create a Neighborhood Watch group. Long Beach Police Department Sergeant Conrad Penn attended the meeting to talk with residents about the importance of reporting suspicious activity, methods of crime prevention such as adding additional lighting to your property, installing cameras, and the importance of neighbors working together to prevent crime in their area. To ask a question, or seek advice about a police related topic, or to request extra patrol while away on vacation, or to report a non-emergency, please call Police Dispatch at (562) 435-6711. Adelita Lopez hosted the Neighborhood Watch meeting. Adelita not only wanted to identify preventative measures that her Neighborhood Watch Group will address, but to make residents aware of volunteer opportunities in Long Beach that may help reduce crime in their area. Adelita invited two women from the CSU Long Beach Rising Scholars program. This program was launched by formally incarcerated students who believe that higher education is key to successfully diverting individuals out of the criminal justice system and toward a better path. The women shared their powerful life stories and how education helped keep them from the cycle of incarceration. If you are interested in volunteering to be a mentor, please contact Irene Sotelo @ irenesotelo777@gmail.com. The next Neighborhood Watch and Potluck Social will be held on Saturday, August 4th at 4pm. For more information or to RSVP please email Danielle at eunetta76@msn.com.